Ryan came to MIT in 1997, and got a Master’s in Architecture, and then at the Media Lab, before entering into the Lab’s Ph.D program. He took leave for 18 months to work on the CityCar project. Ryan’s thesis examines smart customization, and the scientific differences between mass customization and traditional mass production. Is one better than the other? Is one more sustainable? 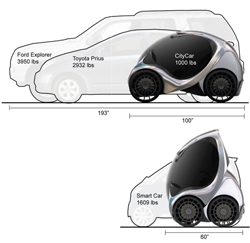 The CityCar is customizable on a number of levels: its base design, its adaptability to its environment (city), and its individual parts’ modularity. Ryan hasn’t only worked on cars; he’s also studied customization of dress shirts. He chose shirts because of their low cost, frequency of use, and relatively easy traceability (see SourceMap). Ryan started with an online customer survey of nearly 1,000 people. People have three types of dress shirt, with regards to fit: standard, made-to-measure with your measurements, and custom-tailored, designed specificaly for oyu. The average male has 14.2 dress shirts for work, but we don’t wear them all. Very few of us own only custom shirts, whereas 76% of respondents owned only standard shirts. He then studied how people actually acquire mass customized products vs. mass produced products. 94% of respondents drove to buy their shirt. 63% of us clean our shirts in the washing machine, but mainly because it’s wrinkled, not because it’s dirty. The main reason we return shirts is that they don’t fit properly. Online, mass-produced shirt retailers see a 40% return rate. That drops to 20% return rate in offline mass-produced shirt stores. Mass customized retailers see only a 5-10% return rate. Whether it’s sold online or offline, mass produced shirts are made pretty much the same way. But when you order online, the delivery of a shirt to your home by truck produces huge CO2 savings over you driving to the store yourself. With made-to-measure dress shirts, nothing gets produced until your order comes in, at which point the order goes to a QA center in China, where an electric scooter brings it to the factory. The carbon costs add up as your shirt is flown DHL to the US. When you get a shirt custom-tailored, the tailor comes to your office to fit you and your coworkers, and then sends the order to Hong Kong. The shirts are made and flown back to the tailors’ studio, which then delivers the shirt and makes additional alterations. This back and forth adds some carbon costs. The vast majority of the the CO2 involved in delivering your shirt comes in the last few miles, where you drive to a store. The mass-produced shirt ordered online has the lowest carbon count, followed by made-to-measure shirts ordered online. Ryan also conducted a post-transaction customer use study using two washable RFID chips inserted into the collar stays on dress shirts. What happens after you acquire the new clothing? They built an RFID tracking system and embedded it into the office environment. Subjects would see a green confirmation light when the shirt they were wearing registered with the RFID readers. The team cataloged a selection of sample shirts and sold them to employees at Fidelity and MIT Tech Review. They collected thousands of RFID reads over the course of the summer and color-coded a grid (or calendar, really) of how often each shirt was worn in the office. People wear their favorite shirts on consecutive days, often in the same order. Ryan calculated an ideal shirt utilization rate: the number of shirts you own divided by number of days you need to wear a shirt. But we favor certain shirts and shun others. Some of us achieve equal distribution, though, working through our wardrobes systematically (“first in, first out”). One man reported that he gets dressed each morning by literally going right-to-left through his closet. Another man saved his custom-tailored shirt for a big board meeting, like a power tie, and felt the desired effect. A third guy wears only his cheap shirts, knowing that he or his children are likely to stain it, while the nicer shirts are never used at all. Others save their nice custom-tailored shirts for out-of-office occasions where Ryan’s RFID readers couldn’t scan them, like weddings and dinners. On average, we don’t wear about 20% of our shirts at all. The mass production shirts got worn a lot, and were generally considered favorites, even over custom-tailored shirts. Ryan attributes this puzzle to better craftsmanship in mass-produced shirts, and fewer opportunities to wear custom-tailored shirts. We should move goods, not people, as much as we can. 16-ton UPS trucks are 24 times more efficient than a personal automobile for delivering goods. Pull-based marketing dramatically reduces inventory. $300 billion in lost revenue in textiles wasted on stocks, transportation of goods, and heavy discounts. Build-to-order automobiles are only 6% of the US market, while it represents 50% of the European market. Persuasive interfaces help people make the right choices. Showing the environmental effects of fast shipping vs. slow shipping works on us. We need to miniaturize retail environments. The big box stores have become . Apple has begun deploying urban boutiques, where the highlight is experiencing the product, not stacking boxes. Customizable Clones: Take the top 5 shirts you wear, the ones you love and the ones that fit, and make the rest of your shirts like those. These shirts are the iterative product of the trial and error represented by the rest of your wardrobe. Local production is controversial. The labor cost is still about 2.5 times higher, even when you account for transportation costs. Smart materials, like the Apollo Fabric, reduce the amount of energy the textiles require after it’s produced. Few retailers know Ministry of Supply claims to be anti-microbial and wrinkle-free, meaning fewer trips to the drycleaners, and higher shirt utilization. Responsible Consumerism would allow us to create the ideal wardrobe, at the intersection of our own desires and environmental benefits. Ryan suggests a carbon label, like US FDA’s nutrition labels, showing the consumer the amount of carbon involved in the clothing article’s production, lifetime use, cleaning, and recycling. How can customization improve the utilization rates of all the things we produce and own? And how do we scale this customization to the scale of a city? Ryan attributes his inspiration to the late William J. Mitchell, and the huge number of people that worked on the CityCar and other projects. Is the era of mass customization over? Ryan points to Joseph Pine’s continuum of mass production, customization, lean production, and craft. All are necessary. The number of customized things is going to increase, but what’s ideal? Standard, mass-produced goods work for many purposes (like Ryan’s current outfit). But there are huge cost and environmental savings to customization. Whether or not everyone feels these costs and benefits will depend on actual environmental policy. Everyone would love a custom shirt, but the average mass produced shirt is $20, while custom tailor shirts can easily cost $80. Custom needs to become more economical. Ryan recommends that we receive a copy of the data generated by the full body scans the TSA requires of us. We could use that data for custom clothing, health, and other purposes. Ryan foresees an “apparel genome,” where all of our clothing is tagged and machine readable, leading to insights about how we choose our outfits, what additional outfit configurations we could create from our existing clothing, and so on. I’ve begun using SuperCook, where I catalog the food in my pantry, and the app informs me what recipes will utilize my CSA-delivered eggplants. It’s not a big stretch of the imagination to consider doing the same for our clothing. Customized goods fit into the broader trends of rent-rather-than-own, where an increasingly urban population favors access over ownership and proximity over storage space.